Early College Experience Program applications are due April 1st to Ms. Christensen in the guidance office. If you are interested in ECEP, please join us this Thursday, 3/21, for an Info Session during Enrichment in the library. Spots in the program are limited. JUNIORS!! Are you interested in attending the Boston National College Fair this spring? Stop by the guidance office to get your name on the list! Space is limited and permission slips are due Monday, March 4th. Congratulations to Quarter 2 Honor Roll Recipients!! 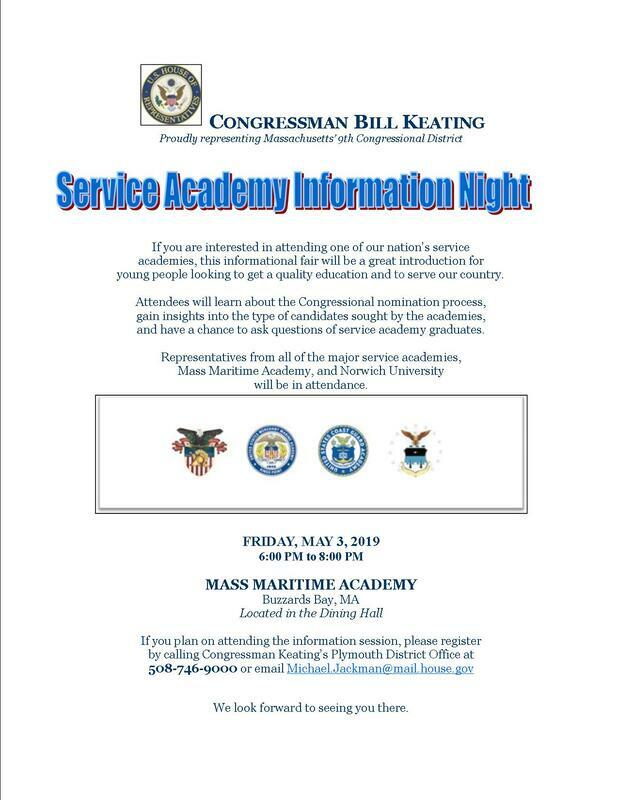 Massachusetts Maritime Academy is excited to provide a Commonwealth Dual Enrollment Program (CDEP) for qualified high school students. The program provides an opportunity for eligible high school students to enroll at MMA as non-degree students and have the course credit be recognized toward degree completion. Must be a Massachusetts resident. Must be enrolled in a Massachusetts public secondary school or non-public school, including home school. Have a minimum cumulative high school GPA of 2.5 or demonstrate potential for academic success through submission of evidence of steadily improving high school grades, high class rank, teacher/guidance counselor endorsement, etc. Must submit a completed application form and official high school transcript no later than February 15, 2019. MS-1211 Current Environmental Problems (3 credits) This course is the first course taken by students majoring in Marine Science, Safety and Environmental Protection (MSSEP). It introduces freshmen students to current and pressing global issues in the fields of environmental science, environmental protection and health and safety in the workplace. Topics will provide students with a broad, general perspective of issues in these fields. Some topics will be revisited in greater detail during subsequent courses in the MSSEP curriculum. Prerequisite: None. EM-2212 Introduction to Emergency Management (3 credits) An introduction to the disciplines, authorities, and policies involved in the field of emergency management. Topics include: hazard analysis and underlying social and environmental processes, vulnerability analysis, hazard mitigation, emergency response and disaster recovery. Prerequisite: None. If you have questions, contact Dione Eaton at deaton@maritime.edu. Save the date for Thursday, March 21st, in the BHS Library, from 11:46-12:42 (Enrichment Block). Thank you to everyone that joined us on Tuesday night for Junior College Planning Night! If you weren't able to make it, here is a link to the packet provided. And if anyone has questions or would like to sit down to discuss further, please feel free to reach out to your student's counselor. This year's Junior College Planning Night is scheduled for Tuesday, January 8th at 6:00 pm in the BHS Library. There will also be a similar workshop for juniors during enrichment on the same day. We hope to see you there! ​Join us on 12/20 in room 25C at BHS during Enrichment (11:42-12:46) for an Information Session for prospective Cape Cod Community College students. An admissions representative will provide an overview of academic programs and admissions process, campus life, academic and student services, financial aid, and more! Parents and guardians are welcome. Please RSVP with Ms. Christensen in the guidance office. The BHS Guidance Department invites you to visit our blog for updates and reminders on important events around BHS. Didn't find what you're looking for?? Please let us know! ​Our website is a work in progress and we welcome your feedback on how to better serve our students and families.